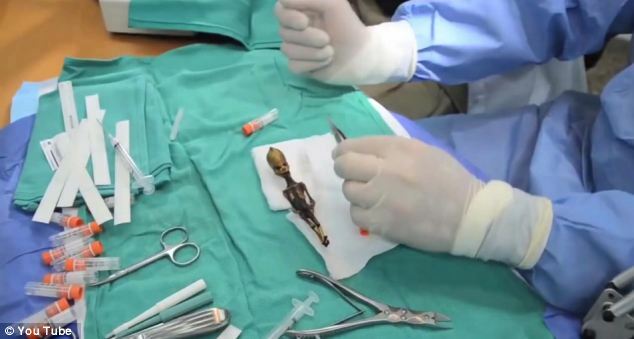 Ten years after the mummified remains of a six-inch supposed ‘space alien’ were first discovered they have been confirmed as ‘human’ by scientists in a new documentary film Sirius. 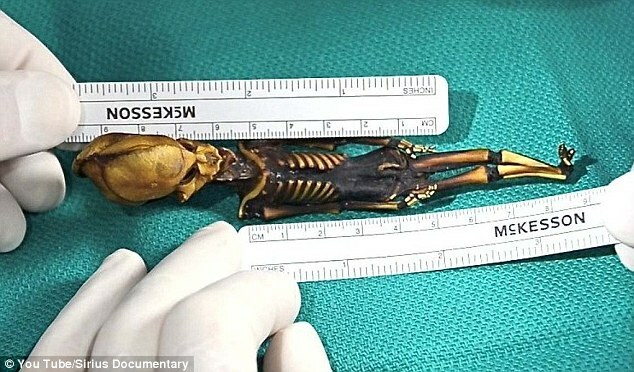 Since the remains of the small humanoid – known as the ‘Atacama Humanoid’ and nicknamed Ata – were discovered in Chile’s Atacama Desert 10 years ago there has been much speculation about its origins. 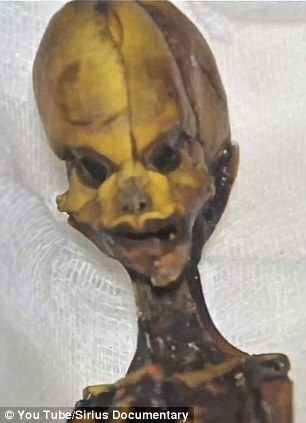 Theories have included that the bones were those of an aborted fetus, or a monkey, or even an alien that had crash-landed on earth. In the weeks leading up to Monday’s premier of Sirius, UFO enthusiasts had grown increasingly excited that the film could announce a major breakthrough in the search for extra-terrestrial life forms, reports The Huffington Post. 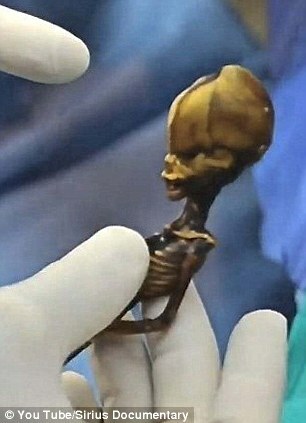 The small skeleton certainly bears many of the hallmarks of what we have come to believe aliens look like, in particular a large head overshadowing a small body. According to Chilean local newspaper, a man called Oscar Munoz found the remain on Oct. 19, 2003 when he was looking for objects of historical value in La Noria, a ghost town in the Atacama Desert. Near an abandoned church, Munoz found a white cloth containing, according to the newspaper, ‘a strange skeleton no bigger than 15cm [the size of a pen]. It was a creature with hard teeth, a bulging head with an additional odd bulge on top. Its body was scaly and of dark color. Unlike humans, it had nine ribs. In the new documentary, a DNA sample from bone marrow extracted from the specimen, was analyzed by scientists at a prestigious American university. They concluded that it was an ‘interesting mutation’ of a male human that had survived post-birth for between six and eight years. ‘I can say with absolute certainty that it is not a monkey. It is human – closer to human than chimpanzees. It lived to the age of six to eight,’ said Garry Nolan, director of stem cell biology at Stanford University’s School of Medicine in California. ‘The DNA tells the story and we have the computational techniques that allows us to determine, in very short order, whether, in fact, this is human,’ Nolan, who performed the DNA tests, explains in the film. In addition to studying the origins of Ata, Sirius explores the subject of UFO and ET visitation, the disclosure of secret UFO files, and the investigation of advanced energy and propulsion technologies extra-terrestrial civilizations are using to travel to Earth. Based on evidence gathered over the past 20 years by physician and Disclosure Project founder Dr. Steven Greer, Sirius reveals how and why these energy technologies are being suppressed in favor of maintaining the current petrochemical system. Sirius premiered in Los Angeles on Earth Day and will be released online and in select theaters worldwide, starting April 22. April 23, 2013 in Hmmm?.